Last night during the Super Bowl, Samsung aired yet another new iPhone bashing commercial. 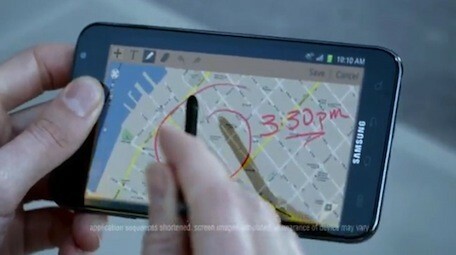 The commercial was to advertise for its new, super-sized Galaxy Note smartphone, which features a huge 5.3-inch display and includes a stylus. The ad, estimated to cost Samsung a whopping $10.5 million in air time alone, follows the same footsteps as the other ads in the campaign. The ad shows what appears to be Apple customers standing in line waiting for a new device when a happy Galaxy Note user walks up and shows interest in the device, the whole crowd eventually gets a free Galaxy Note and they leave the line at the Apple store. Yeah, like any of this would happen in real life. Check out the ad below.